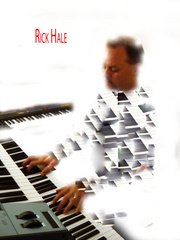 Composer, Producer, Songwriter and Music Instructor Rick Hale currently resides in the foothills of Albuquerque, New Mexico, USA with his wife, Nanette, son David, and daughter Sophia. His passion for music began at the age of five when he was enrolled in piano lessons. Through his teenage years, he developed his composition and skills on various keyboards and learned the latest recording equipment. Rick was fortunate to have studied under the extremely talented and accomplished composer, Michael Mauldin. Michael truly has a gift for teaching, and played an important role in Rick’s music. In addition Michael launched Rick's piano instruction business through his encouragement and generous referrals. Since 1992, Rick has been very fortunate to compose and record music with guitarist extraordinaire, and instructor Brian Moore. Brian also encouraged Rick during his plunge into the music business. His unique style, and trained classical approach adds a rich dimension to Rick's music. 1995 - He created music for a children' s show titled "Kaptain Karate", produced in Albuquerque. Soon afterward, he composed music for the syndicated show "Job Search" which aired on KASA Fox 2. 1999 - Rick was blessed to work with an array of musical talent. He met Nelo Edillon who hired him to re-arrange an oldie into a pop song for a Filipina recording artist, Jam Morales, for her "Love Never Fails" CD release. 1999 - 2002 He produced and recorded "Cumbegue" with Latin sensation, Micky Cruz. "Cumbegue" is Micky's fourth CD, a Grammy nominee in 2002 with the song "Morena", and has been placed on the Atlantic Satellite Music charts. Billboard magazine has put together a Latin sampler compilation CD in response to the Latin explosion, and has included Micky’s song "Morena". It was released to all major Latin radio stations nationwide in December of 2001. 2000 - Rick met another international recording artist named Danny Wilding. Danny has played with many of America' s and Britain's big names, including a progressive fusion band named "Brand X" which he had formed with recording artist Phil Collins. Rick and Danny recorded several tracks together, and performed together in Madrid New Mexico. 2001 - current, Rick met (through Danny Wilding) renowned drummer Garry King. Garry is an extremely talented drummer and producer who has, and currently tours and records with many well known artists such as Jeff Beck, Alice Cooper and Paul McCartney, to just name a few. He currently is involved in many projects including his inspirational "Making It Count" school program, which teaches children the benefits of reliability and responsibility through music. 2002 - 2006 Rick performed keyboards and co-produced, engineered, mixed, and mastered Haley Ackerman' s debut album "All Things Are Possible" and recorded and mastered her 2nd release (solo harp album) "The Healing Stream" which has been commercially released and distributed. Rick and Haley are currently working on her third album. 2005 Rick finished a new project with Garry King, Brian Moore, Marty FitzSimons, and Haley Ackerman His self-titled CD features drummer Garry King, guitarist Brian Moore, guitarist Andres Montoya, saxophonist Marty FitzSimons, and vocalist Haley Ackerman. Currently, Rick is working on new tracks with the same artists, yet to be released. Tracks are available at www.myspace.com/rickhale, www.rickhale.info, www.showcasemymusic.com/rickhale, and www.garrykingmic.com. 2004 - 2007 Rick recorded several traditional jazz groups, meeting the extraordinary tenor saxophonist Marty FitzSimons. Marty performed on the track "Miles Away" from Rick's latest self-titled CD. They are currently recording new music with an urban jazz/fusion. 2006- 2007 Rick has been working with Garry, Brian, and Andres on new audio and video material released to ourstage, myspace, and facebook as of late 2008 and into 2009. Rick Hale Production is avaible as a recording studio or to add keyboards, drums, or guitars to your project. For more information see www.rickhale.info, or visit http://www.facebook.com/pages/Rick-Hale/70538271288 or www.reverbnation.com/rickhale for tracks, video, and additional information.